During the Fairground Festival of Lights, companies will get together for a unique team building opportunity! They will be building structures made entirely from canned goods! 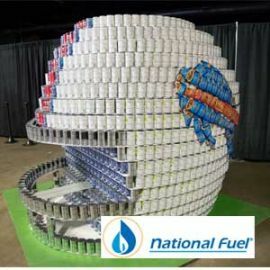 All canned goods used in the creation of these masterpieces will be donated directly back to us and our member agencies. Join in on the fun building or stop by and vote for your favorite! Stop by the Fairgrounds Festival of Lights during the month of December to check out the amazing creations!